Have you met this problem before? You are making an fantastic Arduino IoT project. However, in the code, Wi-Fi SSID and Password were hard-coded and the only way to change these is to edit the code and re-upload the code to Arduino. At home, this is okay, since you Wi-Fi SSID and password will not change frequently. Let’s say you bring this project to a friend place or a venue to demo. And you didn’t know the Wi-Fi SSID nor the password beforehand. Then, you need to bring your computer to change SSID and password and re-upload to Arduino. Is there a way to get rid this problem? Yes! The answer is use Arduino Wifimanager library. Please see the video below to learn how to do this! In this tutorial, I will show you how to make a Voice Control Color Lighting with Google Home or Google Assistant. I used a NODEMCU ESP-12E V2.0 and WS2812B LED strips for this project. Use voice command to say “Set Color Light” + color to change the light colors. For example: If you said “Set color light red”, the lighting will change from current color to “red”. Very sample! Although turn on/off light switch with voice is quite practical in daily life, it’s somehow not so interesting. In this tutorial, you will be able to change the lighting color with voice. 1. Get three core of paper towers and stack them like this at the predefined length. Glue them with hot glue. 2. Cut WS2812B LED strip into four pieces with 30 LED each. Solder three wires on each WS2812B LED strip; Red for + pin; Black for – pin; Green for data pin. Then, cut small holes on the bottom of the paper tower core. This is used for the wire to go through. 3. Glue four LED strips on the paper tower core with double sided tape and let wires go inside the paper tower core. So we could collect all wires to the base for easier connections. 4. Here I used a thicker paper box as the base and cut a hole on the center top. Also, I fill the inside with Styrofoam to make the base more stable. Then, drill a hole that’s roughly the diameter of the paper tower core. 5. Place the paper tower core into the hole of the paper box. 6. To decorate the base, I used wooden color paper sticker to wrap around the paper box. It does look better! 7. Cut white plastic cardboard into equal length that’s roughly longer than the total height of the paper tower core. 8. 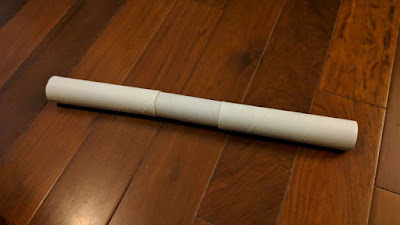 Glue these white plastic cardboard into a long squared tube as shown. 9.Insert the paper tower core with LED strips into the base with all the wires to go through the paper box base. 12. Now, place the white plastic square tube on the paper tower core to diffuse the LED colors. 13. Light it up. It looks pretty good! 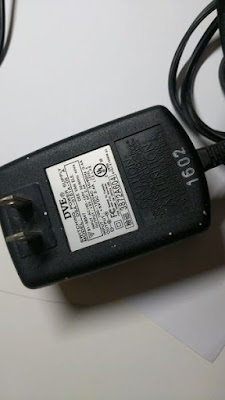 PS: I reused a 5V/2.4A old power adapter. I think this is bright enough for the LED lighting. Do not use 5V/1A or 5V/1.5A for this project, the light will be incorrect and very dim. This video shows you the detailed connections on NODEMCU and WS2812B LED strips. SSL/TLS additions by Todd Treece for Adafruit Industries. // THIS EXAMPLE demonstrates the second, "color temperature" control. // and a few seconds later, with a different temperature profile. // The first pixel of the strip will show the color temperature. //   a white wall, table, or piece of paper, and look at the reflected light. //   the lowest 'indicator' pixel. // Setup a feed called 'test' for publishing. // *** NOTICE: adafruit.io publishes the data as strings, not numbers!!! Control multiple WS2812 strips easily! //Turn on Blue LED to indicate it's connected. This is the part 3 of the "Voice control with Arduino and Google Home Mini" tutorial. This section primarily explain how the program on ESP8226 worked. This section of code is basically define relay pin numbers and status variables. See the comment in code that pin 13 is actually NodeMCU pin D7. You may see the NodeMCU ping mapping from this article. This section is the basic settings, from Wi-Fi SSID and password to your Adafruit.IO user names and AIO_KEY that I reminded you to make copy is needed here. Exchange all the information below with your own for this program to work. 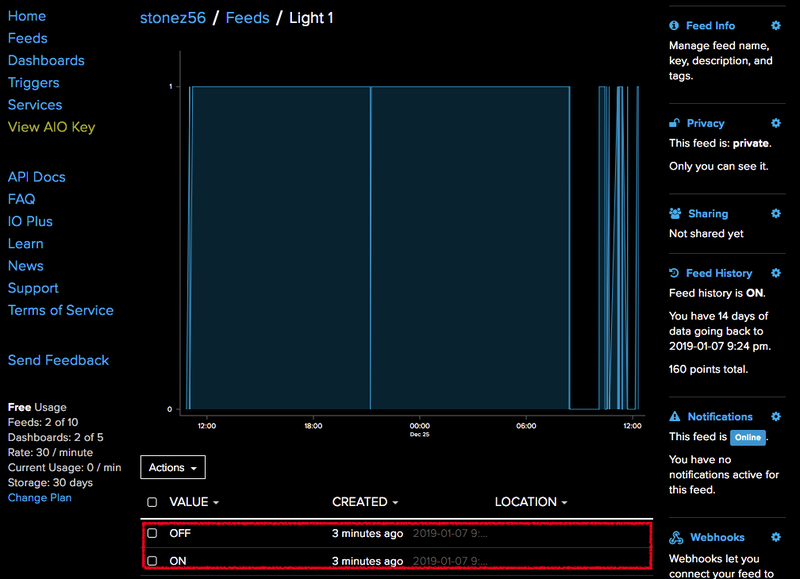 In Line 62, the code set up a subscription at Adafruit MQTT service Light 1 to get real time updated value. "/feeds/light-1" is the subscription name and it must be the same with the one you defined at Adafruit "Feeds". In Line 63, it's reserved for future program extension to control RGB color light. In Line 51, it's a MQTT publish feature that allows you to upload message from ESP8226 to Adafruit.IO MQTT server. You might need it for other projects. This part is Arduino setup function. Basically, this setup Arduino serial monitor output and connect ESP8226 to your Wi-Fi network, as well as subscribe to MQTT services. The Arduino loop keeps checking with Adafruit server to see if there were new messages. If there were new messages, then further check the subscription name. If the subscription name is equal to light-1, then check the light-1 feed_lastread content. If feed_lastread is ON or OFF then, the program call switchRelay function to either turn on light or turn off light. This part also check the further project extension for color-light status. This is the SwitchRealy function, it either turn off or turn on the relay module and print out the current status on Arduino serial monitor. This part is all directly from Adafruit sample code. Just keep them here. This is the part 2 of the "Voice control with Arduino and Google Home Mini" tutorial. This section primarily explain how to setup the Adafruit MQTT and IFTTT related services. Watch this video to see how I setup the Adafruit IO MQTT for this tutorial. This video has English Closed Captions, if you needed it. If you would like learn more about MQTT, please visit Adafruit website to see it's great tutorials. Highly recommended for anyone not familiar with this technology to read. Why MQTT : Good to read! 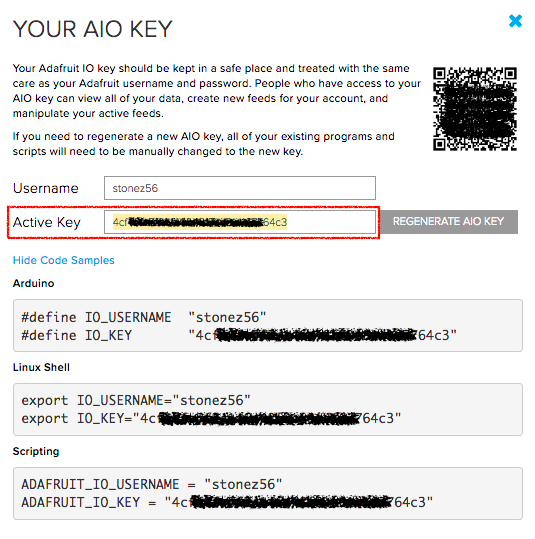 AIO Key is your personal key that allows your Arduino ESP8226 to talk to Adafruit IO MQTT server. Keep it safe and not to share with others. Log in to your account and Click "AIO Key" on the left menu. Write down the AIO Key for Arduino ESP2886 coding use later. Here is how I setup my IFTTT Applet for this tutorial. This video has English Closed Captions, if you needed it. Turn on Google Home Mini and say "Turn on light one". Install IFTTT App on your smartphone, if you used a smartphone rather than a Google Home. Google assistant should reply "Sure, light one on". From the Adafruit feeds page, you should see the data showing up there immediately reflecting the message you sent; in red square below. Then, your setup is successful! The 2nd part is completed. In the next section, I will show you all the physical setup and the Arduino codes to make this project work. If you used a smartphone, please ensure the built-in Google Assistant is enabled. Check how to enable Google Assistant here. If Google Assistant is not installed, get it here. For IFTTT related issues, please check this IFTTT help topic here. Until then, see you next time! If you liked my work and decided to support this blog, please consider to donate. This blog is based on the Creative Common Licensing: Attribution(by), NonCommercial(nc), and ShareAlike(sa) authorization. Content are Creative Commons Attribution 3.0 License. Codes samples are Apache 2.0 License. Powered by Blogger.